First things first: the venerable Twelve Bar Blues chord progression, the backbone of the blues. You'll learn how to use the 1, 4 and 5 chords to do chordal accompaniment, the Blues Shuffle and the Guitar Boogie in the most common blues keys, A and E.
Then comes blues lead playing and improvisation. The Minor Pentatonic Scale in the Key of Em will be our first concern, with additional notes added as needed. Then we move on to the C-A-G-E-D box patterns that are found up the neck in the Key of Am and learn how to shape-shift. 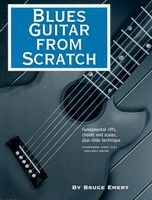 Finally come sections on slide guitar playing in standard, open G and open D tunings.